Click here for more about LeRoy's birth family. 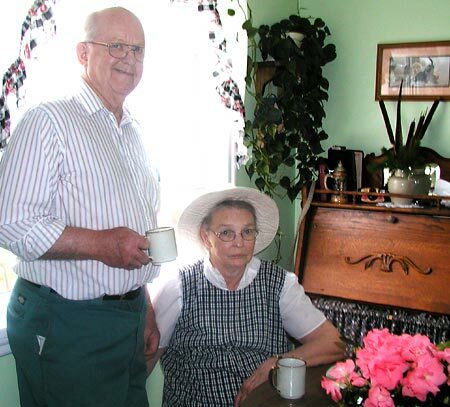 Click here for more recent news of the LeRoy and Vonnie Dake family. To answer the question about how I fit into the family: I am Dorothy's younger brother. She is my big sister and is privileged to call me "Bubsy." That is what everybody in our family called me until I started school. I was born on July 5, 1928, and I am younger than my wife -- she was born July 3, of the same year (1928). Her name was Vonnie Thomas. Her folks were Mamie and Ivan Thomas. Mine were Bill and Amy Dake. She grew up near Elk River and I grew up near Howard Lake and it took us a few years to get to know each other. By the time I met her she was a registered nurse and I was learning to farm with my dad. We were married on August 30, 1948. We farmed south of, and between, Dassel and Cokato. We have three children: Ernest LeRoy "Ernie" Dake, born May 14, 1951; Virginia Lee "Ginny" (Dake) McCorkell, who was born January 3, 1953; and Larry Thomas "LTD" Dake, whose birthdate is Dec. 13, 1955. They have all written for The Bulletin. During the time we farmed, Vonnie was a nurse in three different hospitals. One was in the Cokato hospital. She helped take care of Dan Mellon and his mother Marcella, when Dan was born there. She thinks she remembers that Tom Mellon was born there, too -- but isn't sure of that. She also worked at the hospitals at Glencoe and Litchfield. When farming did not make us a decent living, we moved to a set of farm buildings near Lester Prairie. I took a job with Schwartz Manufacturing there. It was a good, but noisy, job and was run by the man who started the business. We were all treated well. A conglomerate bought them out and that is when working conditions went down hill. When a friend of ours told us that Honeywell would be a good place to work, I went there -- to the old Ford plant at 5th Avenue in Minneapolis. I worked there about three years, and in several other buildings, then retired from the 103 arsenal building, in 1992. We bought a home in Blaine and we still live in it. We made an apartment in our walk out basement area and several of the family members have lived there in their time. We still live here but lots of changes have been made. Suzanne McCorkell was the last person to live in our apartment, and to this day, every once in a while we think it must be time for her to come up and head off to work. :) She traveled a lot with us, and we really do miss her, but we know she is doing what she loves to do! Vonnie worked at a couple hospitals since we moved here. She did some work at Swedish Hospital, also at Unity Hospital here in Blaine. But her work load got to be too much for her as she began to feel the first effects of the diabetes, which has caused a change of life style for us. She monitors her blood sugar but needs to be watched as she slips into a coma so easy. I spend a good part of my time maintaining our home and doing the household chores. It is good we have Ginny nearby as she stays with "Mother" when I need to be away. We are privileged to have our Sunday meeting here, and also our Wednesday Bible study, which we enjoy! We were glad to be able to get to the Dake Cousins Reunion last summer and to Convention at Eagle Bend last fall. We are mostly "stick at home people." 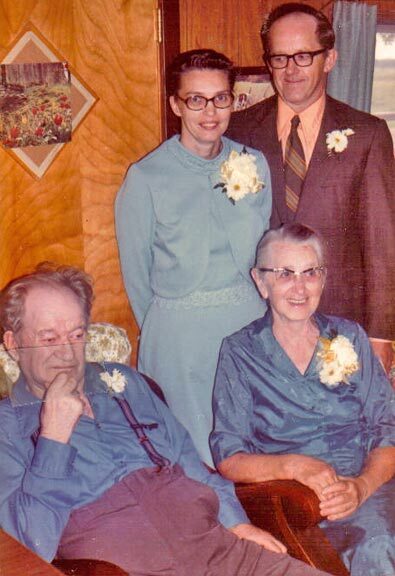 Vonnie and LeRoy celebrated their 25th Wedding Anniversary in 1973 at a combination reception for LeRoy's parents' 54th Anniversary. 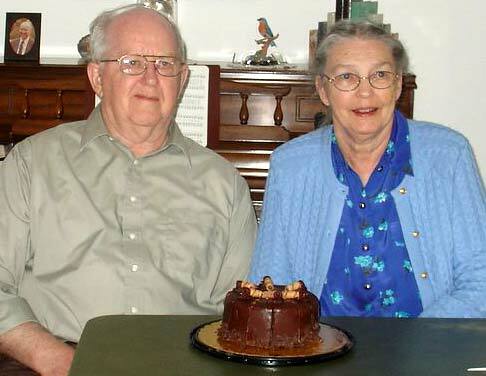 LeRoy and Vonnie Dake were married August 30, 1948. Bill and Amy Dake were married on September 3, 1919.